At these schools, you can build an awesome snow sculpture after (or instead of) hitting the slopes. 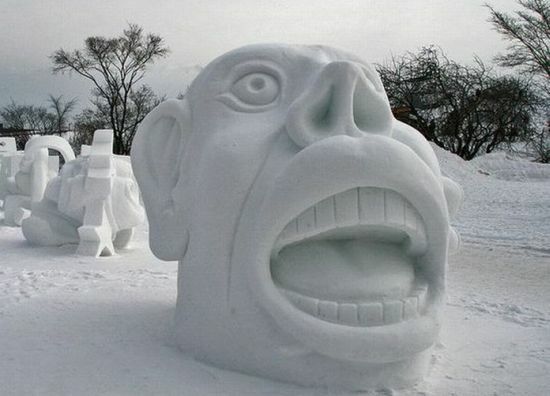 Competitive snow sculpting can get pretty intense! Hone your skills at any one of these wintery campuses. If you look at snow and see a blank canvas, you’re not alone – students at these schools take snowmen and snow sculpture building seriously, and they have the pictures to prove it. Read on to see what kinds of cool creations you could make if you choose to attend one of these cold-weather colleges. Getting to build snowmen and snow sculptures makes the cold weather at these colleges much more fun. Located in the snowy city of Hanover, NH, Dartmouth College hosts an annual winter carnival that includes a snow sculpting competition. Impressive sculptures have included ships, castles, and awesome caricatures like the Cat in the Hat or an alumni favorite from 1951 (see picture below). Located in the snowy town of Incline Village, NV right next to Lake Tahoe, Sierra Nevada College is located in the perfect area for skiers and snowboarders. However, those who have a more artistic flair can choose to participate in the school’s snowman building competition instead. This past winter, one savvy student decided to give his little man a ‘stache. The twin cities are notorious for bringing on the snowy weather (they get about 49.9 inches a year), and Macalester College, located in St. Paul, MN, is right in the thick of it. These long winters give students plenty of time to come up with creative ideas for their next snowmen – for instance, ones that stand on their head. Named the snowiest big city in America by Forbes, Denver has an average annual snowfall of 60.3 inches, and the University of Denver takes full of advantage of this fact. The school’s winter carnival became an annual tradition in 1961 and the flagship activity that year was an on-campus snow sculpture contest. Pictured here is a Marge Simpson snowman that popped up on campus during a more recent winter storm. Middlebury College, located in snowy Middlebury, VT, puts on an annual winter carnival that features a ski race, bonfire, ice show, hot chocolate bar and snow sculpture competition. Past students have built some really impressive sculptures like this awesome looking ice cream cone. Getting to build snowmen and snow sculptures makes the cold weather at these colleges much more fun. We would recommend packing a few extra pairs of gloves and snow boots, though.